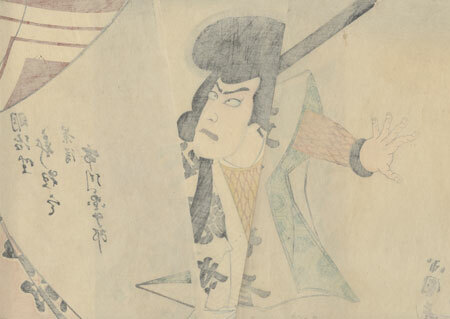 Comments - Terrific design of Ichikawa Danjuro IX as the warrior Taira no Kagekiyo gripping a naginata, striking a bold pose with one hand thrown out at his side. He frowns angrily as he stares to the side, wearing a white kimono patterned with writing over his armor. His cropped hair sticks out like a bushy halo atop his head, with longer locks over his shoulders and a low ponytail over the back. 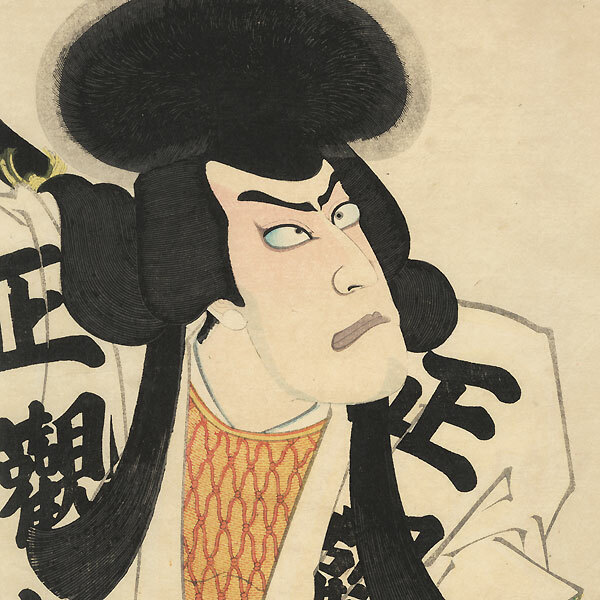 A light orange curtain is drawn to the side at right, patterned with the actor's name and the three concentric rice measure crest of the Ichikawa Danjuro line of actors. A fantastic design, beautifully detailed with burnishing on the hair and sword hilt. Condition - This print with excellent color and detail as shown. Three separate panels. Small loss at corner, a few holes, repaired. Slight toning and soiling, a few creases and marks, a few stains. Please see photos for details. Good overall.